When it comes to my hair and the products I use, I'm really fickle. My high-end splurge of choice is the iconic Aveda Shampure but for more regular washing, I shop at Superdrug - scouting whatever is on offer. I will try whatever and I'm always looking for something that revolutionises the condition of my hair, beats frizz or helps prolong the time between washes. My hairbrush of choice is a bristle brush as it tends to be the most gentle on my hair, this one is from Denman. I'd love a Mason Pearson, but for now, it's just that little bit too treaty. The bristles don't drag my tresses, they simply glide through whilst adding a little shine. 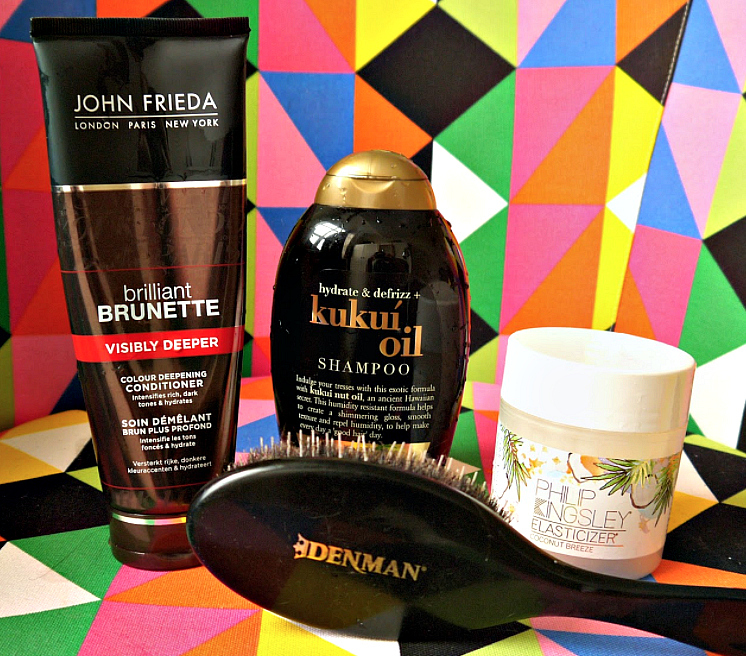 I am currently coveting a few new products that are working a treat for my hair. Think manageable, frizz free hair that's soft and shiny without feeling weighed down or heavy. The first is a product I've mentioned before in this post coveting summer hair care. 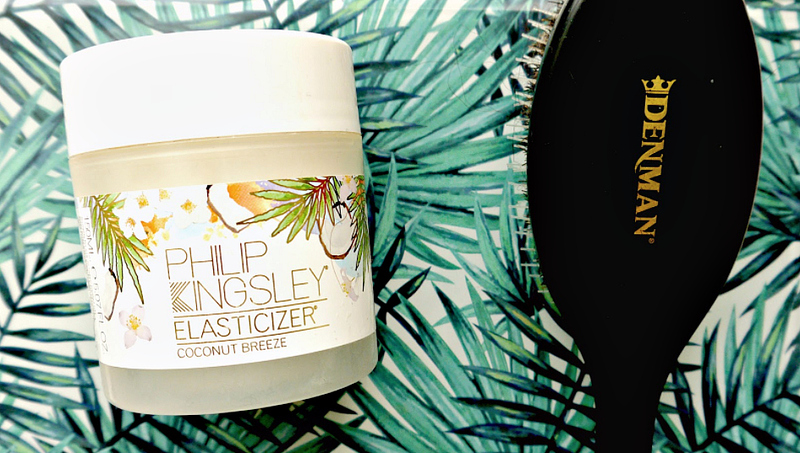 It's the iconic Phillip Kingsley Elasticizer in the 'Coconut Breeze' variant. I use the pre-shampoo once a week to deep condition my hair and help prevent further damage via snapping. For shampoo, I am using the OGX 'Kuku Oil' variant and take my word for it, it smells ah-mazing. It's on the pricier end of the scale for £6 but it makes for one of the nicest hair washing experiences ever. The scent of it is like holiday's, coconutty and sweet. Created to help resist humidity and defrizz, I haven't noticed any particularly groundbreaking results on that front, but it is softer, stays less greasy for longer and leaves my hair smelling gorgeous. 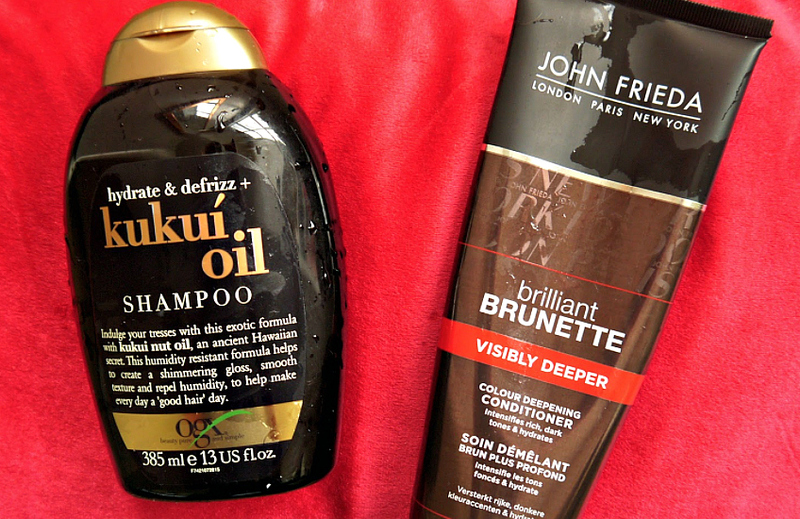 My conditioner of choice is the 'Brilliant Brunette' - Visibility Deeper conditioner from John Freida. I love the Brilliant Brunette range as again, it smells gorgeous and leaves my hair feeling super soft. In terms of the deeper notes, my hair does look richer - but could that be because it's been washed? The packaging states that 'for deeper tones use the accompanying masque so I'm not sure if this does actually work but it does feel lush.